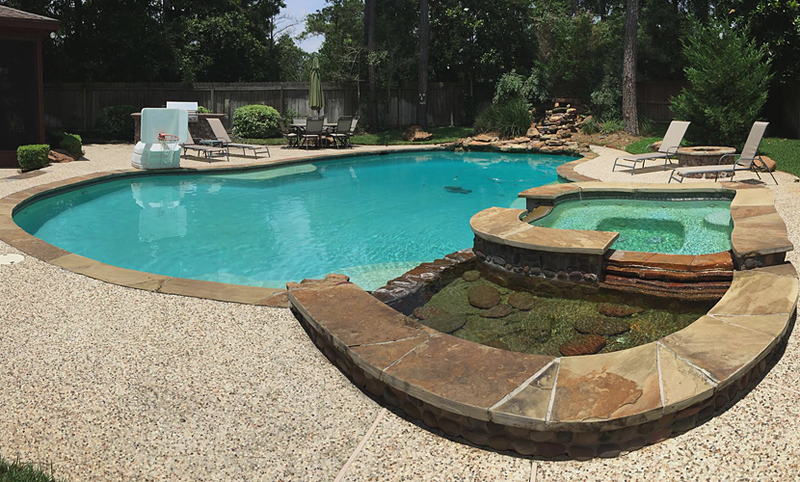 Last week we wrote about the three main types of plaster that we use as finish on pools. Today, we’ll delve more into each type of plaster, the advantages and disadvantages of it, and how to maintain and take care of your plaster once it’s installed. While we did a short overview on the types of plaster in the earlier article, it’s time to go more in-depth into the benefits and drawbacks of each type of finish. Regular white plaster: This is the most common type of plaster that is installed for several reasons: It’s the base of all plaster finishes, it’s the easiest to install, and it’s the most affordable. 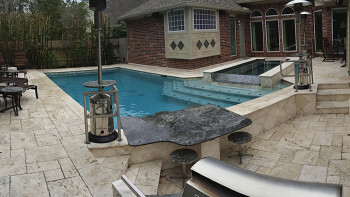 Along with being the “default” type of plaster, white plaster is also the easiest plaster to color, making it a popular choice for people that are looking to add a bit of a dash of flavor to the finish of their pool. The cost and the flexibility make white Portland cement the finish of choice for many, but choosing the basic finish makes it very important to pay attention to all of the elements of your pool, especially water chemistry. White plaster is easy to damage if your water chemistry isn’t on point. If your water is more basic than acidic (or too acidic), it can eat away at your plaster and could cause you to have to replaster your pool down the road. That would eliminate any savings you received from choosing white plaster in the first place. Deficient water chemistry can also effect the color of your plaster. Having your pH a little off can cause uneven coloring down the road. Quartz plaster: Quartz plaster is a popular alternative to the basic white plaster due to two factors — durability and attractiveness. As we mentioned in the first article, the quartz finish has a similar look and feel to counter tops you’ll find in a kitchen, as they are sturdier against the main chemicals of a pool (chlorine and muratic acid). Quartz is a hard surface that will stand the test of time. 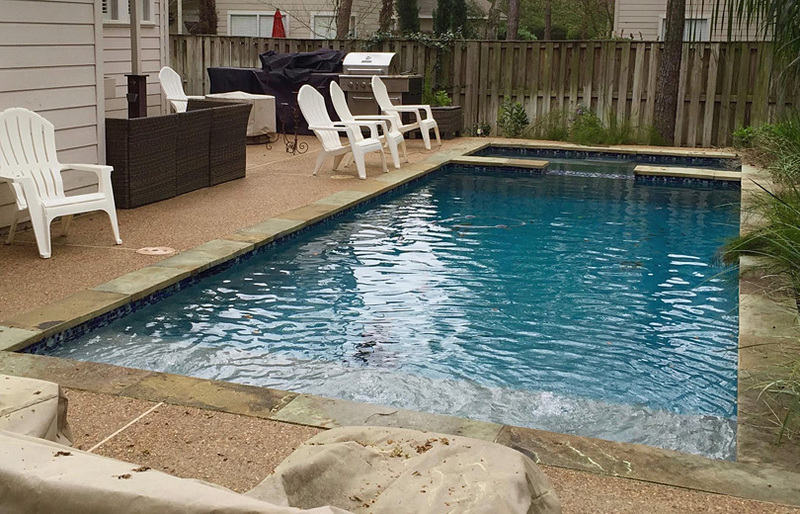 That durability makes it worth the increased cost for many, as pools that have a quartz finish need to be replastered a lot less than its white plaster cousin. But it’s not completely infalliable to water chemistry problems. While the chemicals of the pool won’t eat away at quartz, the cement base of quartz makes it especially vulnerable to scaling, as the water can extract calcium from the exposed cement and leave annoying marks along the surface. The IntelliChem is a valuable tool with a quartz finish, as it can tell you if your water chemistry is scaling. And like we wrote earlier this month, a little scale now can cause a lot of annoyance later. Pebble plaster: Think of pebble plaster like a luxury car — if you can afford it and it’s important for you to have it, you’ll be pleased with the purchase. Pebble plaster is the BMW, Mercedes and Jaguar of the pool-finish game, as the pebble, stone and white ash styles provide a smooth, soft surface that’s as easy on the feet as it is on the eyes. It’s also less prone to deterioration or staining. The luxury car comparison does fit though, as pebble plaster costs quite a bit more than both white and quartz plasters. Therefore, a pebble plaster surface must be a priority. If you are working on a budget and want elements such as a waterfall, an elevated spa, or a lap pool more, then it might be tough to add pebble plaster to the menu (though more power to you if you can). Pebble plaster is also not flexible as far as coloration. Like with many luxury items, what you see is what you get. Asked for pebble plaster to be colored is like asking for steak sauce in a premier steakhouse. You might get a funny look. Now you know the ins and outs of the types of plaster, we’ll talk about how you take care of the plaster. As with most things in your pool, maintaining the correct water chemistry is key. When it comes to plaster, it’s best to keep your pool’s pH on the acidic side. Rodriguez recommends having your water in the 7.2 range, as the acids combat calcium buildup and staining on the quartz and pebble finishes while keeping the dissolving of the white plaster at a minimum. If you already have plaster issues, there are a couple of directions you can go depending on the types of plaster you have. If you have quartz or pebble, getting an acid wash is a good way to proceed. There are two main methods of acid wash, a basic acid wash and a non-grain acid wash. Both involve making the water extremely acidic (6.3 or 6.4 pH) and allowing those acids to eat away at staining. A basic acid wash is a three-day process, while the non-grain wash runs five to six days. An acid wash isn’t advised for white plaster, as the acids will eat away at the finish. Instead, you can try a lighter, less-acidic wash or get your pool replastered entirely to bolster your surface. When getting a pool replastered, you’ll need to have a bond coat applied to the old surface. That will meld the new plaster to the old, adhering the surfaces to prevent breakage, slippage, or any other source of unevenness. Think of it as applying primer before painting your house. While crystal-clear water and great tiling are important aspects of your swimming pool, plaster provides the foundation for your pool’s look. Plaster is the coating over the gunite shell that provides the surface of your pool. The right plaster can give your pool’s surface an attractive look that accents your entire backyard swimming environment, as that finish will make your pool stand out. So how do you pick the perfect finish for your pool? To help you do that, Ultimate Pools will give you a bit of a crash course on plaster. 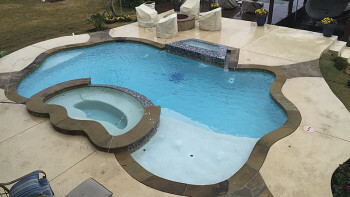 Today’s article will breakdown the different types of finishes that you can have installed in your pool, while our next article will break down some of the variables that go into selecting and taking care of that plaster. 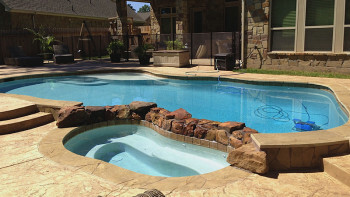 There are three main finishes that are typically installed on Ultimate Pools pools. All of them contain the same base, but the additional ingredients make the aggregate product of each unique. Here are the main three types that we usually deal with. Regular white: This is actually the base of all the plasters that we deal with, as this white coating comes standard for installation over all gunite shells. This plaster is made from white Portland cement, making it easy to install and color with dye packages and paint. However, this type of plaster is the least durable of the three and make white plaster susceptible to staining and dissolving if your water chemistry is not on point. Quartz: For an additional fee, you can get quartz injected into your plaster. There are several benefits to this, the main one being the increased sturdiness of your finished surface. Quartz is a harder material which is used in a variety of furnishings such as indoor kitchens, making it more durable to the wear and tear your pool will face. 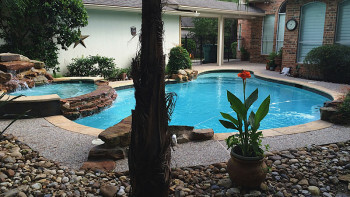 While a quartz finish will not be susceptible to flaking or being eaten away by the chemicals in your water, it does expose a lot of cement to the water of your pool. That increase the odds of staining, as the calcium components of the cement can cause discolorations on the surface if the water chemistry is off. Pebble: Unlike the previous two types of plaster, pebble plaster does not involve a high level of exposed cement at the surface. Instead, the surface consists of smooth rock, as there are three main types of pebble finishes — pebble, stone and white ash. These stones make for a smooth, even, softer surface and the rounder the stone, the better the surface feels on your feet. And the lack of exposed cement makes staining less of a concern while containing similar durability to the quartz finish. The concerns about pebble are the price (it costs a decent amount more than the quartz and white plaster finishes) and the lack of coloration options if that’s a priority. The surface color will be even, but the color options are based on the type of pebble selected. “We aren’t Sherwin Williams,” Rodriguez said. These aren’t the only plaster finishes that are available, as you can get a glass finish. But the above three finishes are great places to start when looking to fulfill your plastering needs. Stay tuned for the second installment on plaster.